Hello! I'm popping in to share a card I created using this week's sketch. 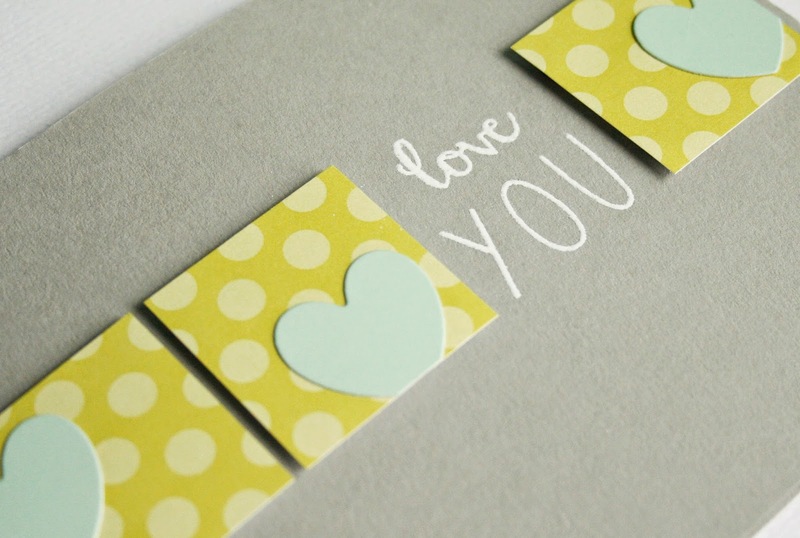 To create my card, I started with by cutting three 1 1/4" squares from green polka dot patterned paper. 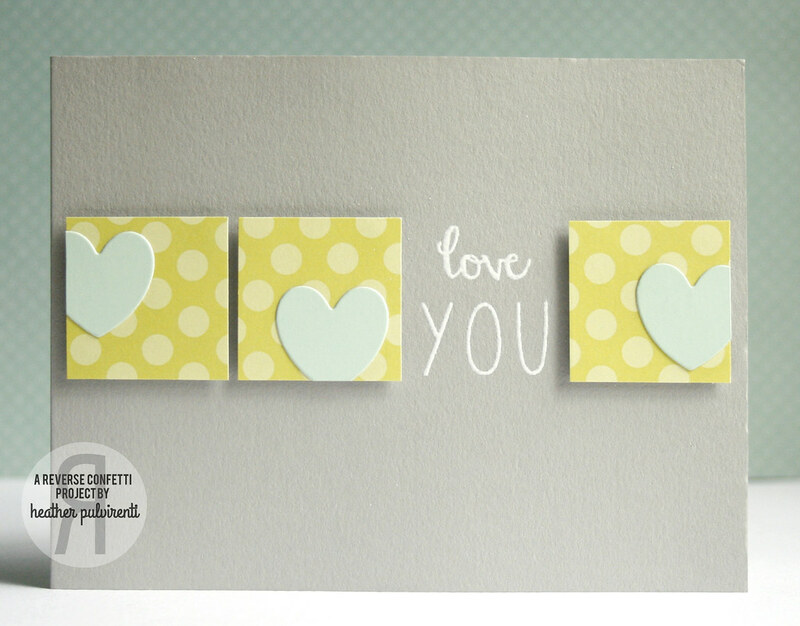 I then die cut three hearts from mint CS using one of the Love Notes dies, and adhered them to the squares. Next, I arranged the squares on the front of the card to get their approximate placement, then heat embossed the sentiment from All About You in white. To finish up, I adhered the squares to the card front with pop dots. Well, after seeing Papertey Inks make it Monday video I was inspired! The splatter look is pretty popular right now!! The colour combo I chose for this card is Colour me…! challenge colours! They blended so nicely together (after a few tries). And this sketch….very much a Chera sketch! I saw it and fell in love! Such an easy one to do with so many different options!! To make this, I die-cut 3 squares, then painted them with Twinkling H2Os. 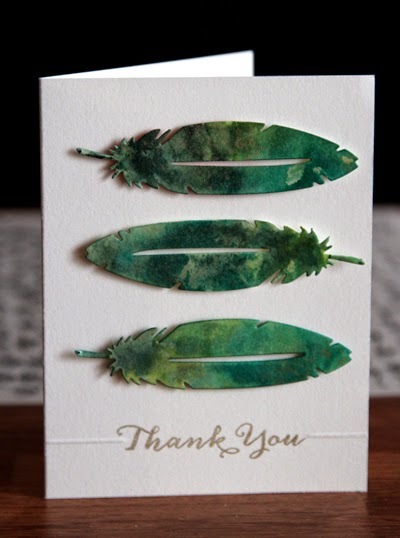 Next I stamped the leaves and embossed them with white embossing powder. I was in the mood for some watercolouring fun. I pressed several different ink pads onto a large clear block, spritzed that with a bit of water, then dipped each die-cut feather in it. Afterwards, to add a bit more glitz, I spritzed them with a gold pearl-ex/re-inker/alcohol spray I mixed up. Due to the holiday, I kind of forgot that today was the day for scheduling the sketch. Today was a family packed day, so by the time I got home, I wasn't really up for any creativity. However, I still have the sketch ready! For the stamped layer, I cut it to 5x3-3/4. Next I drew a grid, each rectangle was 15/16x1-1/4. I actually ended up using those guidelines to find a stamp set. I came across the Fresh Baked set and thought it would go perfectly! 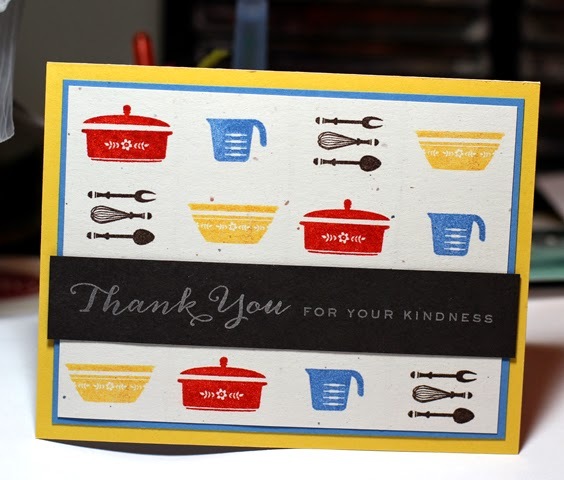 I figured this would make a nice thank you card for a wedding, shower, or housewarming gift. 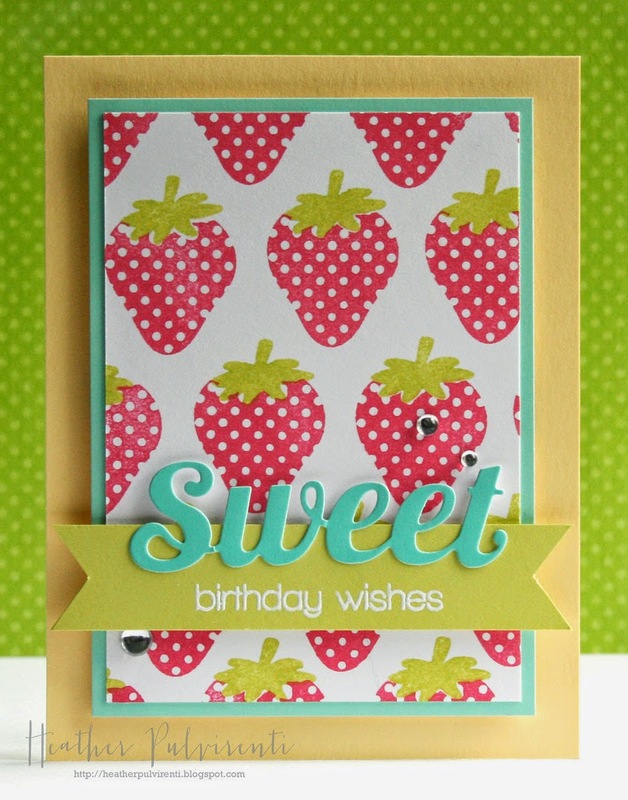 To create my card, I started by stamping the strawberry image from Whimsy Stamps' Feeling Fruity, then topping with the greenery. Next, I adhered the stamped layer to mint CS before adhering to the card base with pop dots. 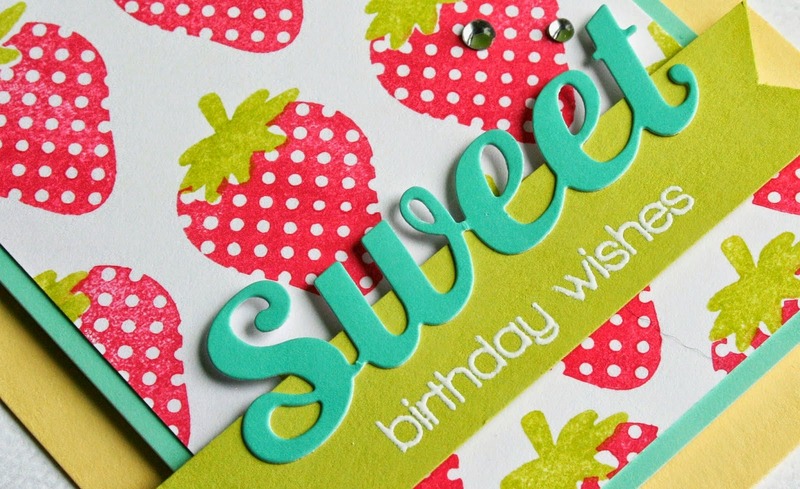 I cut a strip of green CS, and stamped and heat embossed the sentiment from Sweet as Candy. 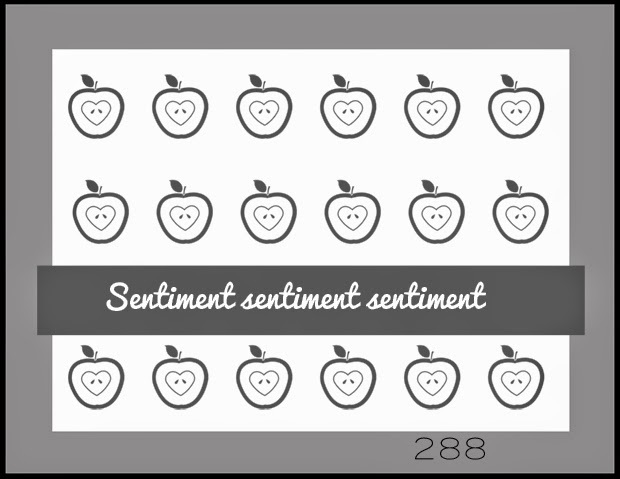 I then die cut the large sweet sentiment, and glued it to the green CS banner. To finish up, I adhered the banner to the card front with pop dots and embellished with clear gems. Here's my take! 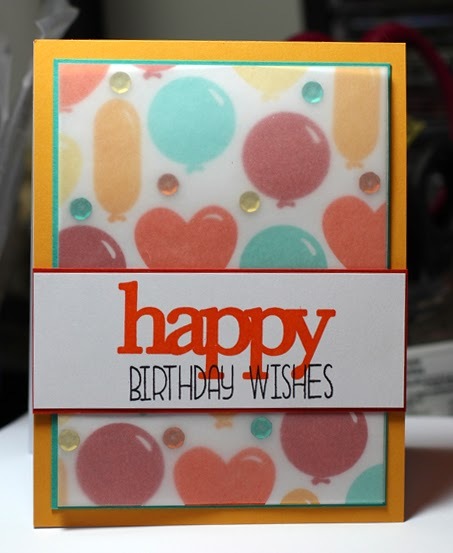 I stamped a vibrant background using the balloons in AWhole Lotta Happy. I added a few sequins and then subdued it with a layer of vellum. Hi friends. 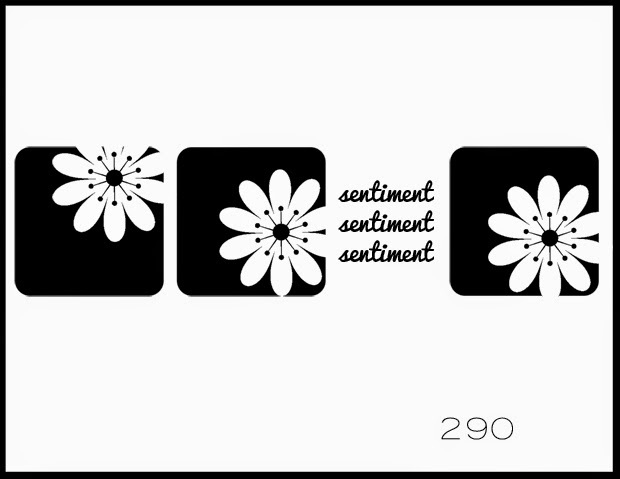 Can you believe we are up to 286 sketches now?! That's exciting and I think we all should leave Natasha a big congrats and thanks on Friday when she puts up a new sketch for us. A lot of work goes into these sketches. By my math, that's about 5-1/2 years of sketches. As you all know, I'm going to be a first-time grandma to a baby boy in May. I can't believe I'm still going to have a grandson! I've been doing this Grandma Series over on my blog and here is one of the cards. I do need to get cranking on his first Easter Basket! I have the basket picked out and it should be up on my blog later this week. 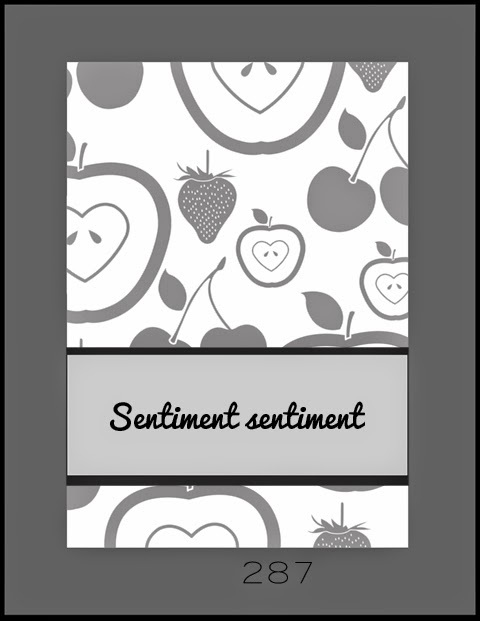 For today's card, I saw a card very similar to mine somewhere and I'm usually very good about writing stuff like this down so credit can be given for the inspiration. I started with a Papertrey Ink Vintage Cream card stock base and then did a technique I have not done in a long time and that is debossing with my Nestabilities. In the center circle, I debossed where my paper pierced elephants are using the Precious Patterned Paper by Authentique. I used some cool Studio Calico Color Theory sequins that were threaded through Stampin' Up! Pool Party Twine to mimic the little animals hanging down from a baby mobile but mine are sentiments instead. I cut my sentiment from Spellbinders Nestability Circles and dry embossed those as well. I stamped the word "LOVE" under my elephants using Mint Mint, again from the Studio Calico Color Theory product line. 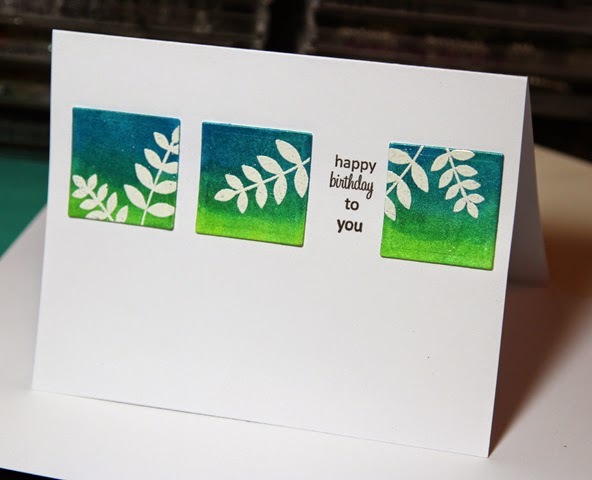 When you stamp, at first the color is all splotchy but when it dries fully, it looks wonderful and complete. I used A Little Lovin' from Paper Smooches Stamps. As I was cleaning up, I two rogue star sequins just fell on the card and so I went with it defying the rule of 3. I adhered the star sequins to the card using Studio Calico Color Theory Enamel Dots and then used another enamel dot to compliment the start. It's strange that there are no real color names to the embellishments but they are close enough to the inks to figure it out. I hope that you enjoy this card. God bless you and I will see you the next time around. Wait a second! Wrong card! Oh. My. Gosh! Well, I hope that you enjoyed the card and now the RIGHT CARD is below. Sometimes…. I water colored this card and definitely need to practice. It's been such a long time since I water colored! All supplies are from Stampin' Up! 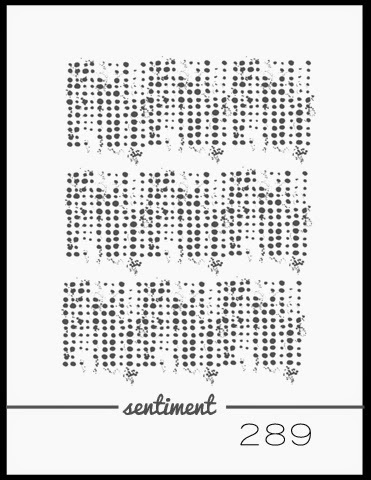 with the exception of the My Favorite Things Pierced Circle STAX Die-Namics, the Teresa Collins Enamel Dots and the sentiments come from WPlus9 Easter Blessings. Enjoy!